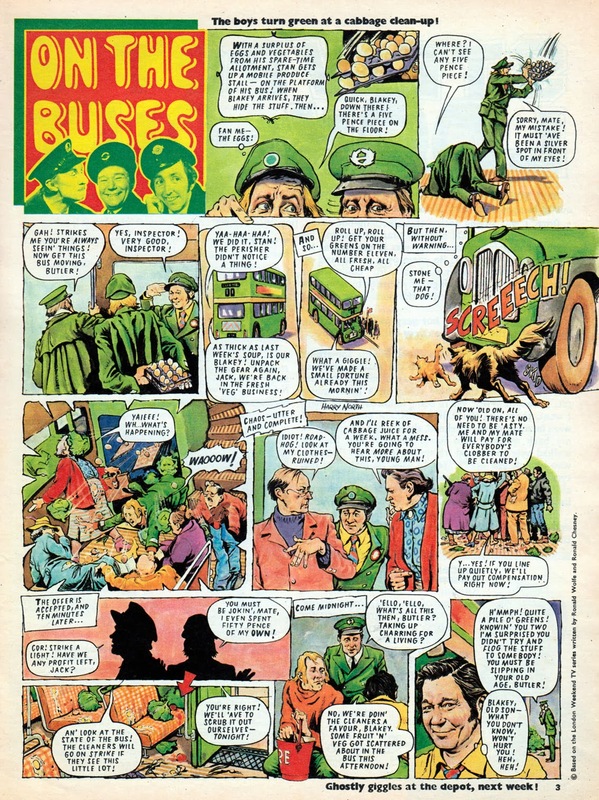 Look-In was one of the success stories of 1970s British comics. Published by Independent Television Publications Ltd, it was sub titled 'The Junior TV Times' (and TV Times was also published by the same company back then). 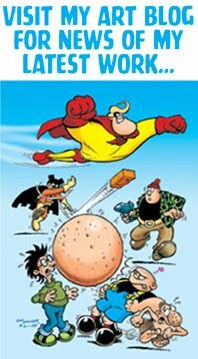 Edited by Alan Fennel, who had previously edited the hugely successful TV Century 21, the ITP comic had its own style, combining features on ITV stars and programmes alongside comic strip versions of popular family shows. 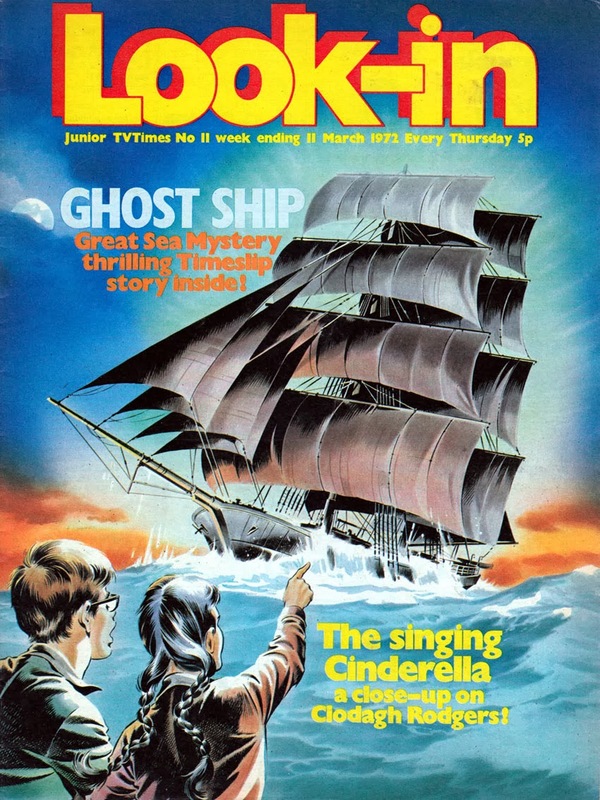 Look-In later began featuring popstar pin-ups and features, which proved very successful, but in its early days was very much a TV orientated magazine. 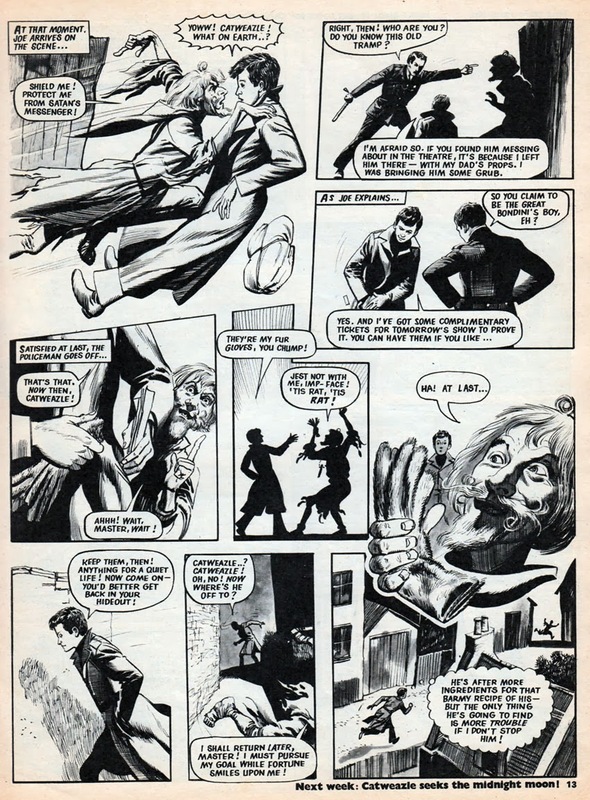 Here are a few pages from issue No.11 (Look-In renumbered itself every January) that went on sale this day in 1972. 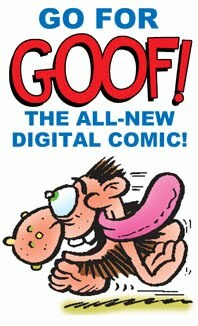 The cover is by Mike Noble, who had been the original artist on the Timeslip strip (although the interior strip in this issue was by another artist). 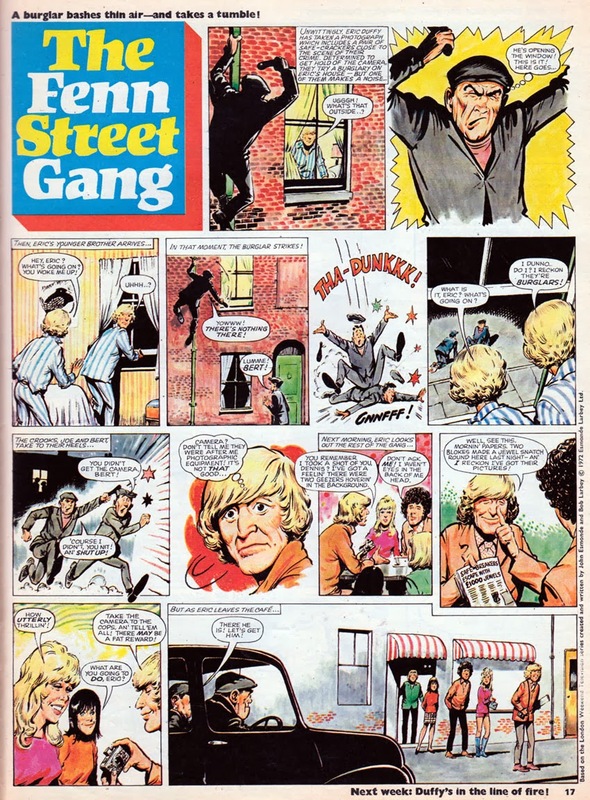 Inside, Harry North's On The Buses strip avoided the sexist jokes of the TV series, and went for more of a slapstick approach more suited to the comic's young readership. Catweazle was a very popular children's TV show at the time, so it was only natural the man-out-of-time would appear in Look-In. Artwork by Gerry Embleton. 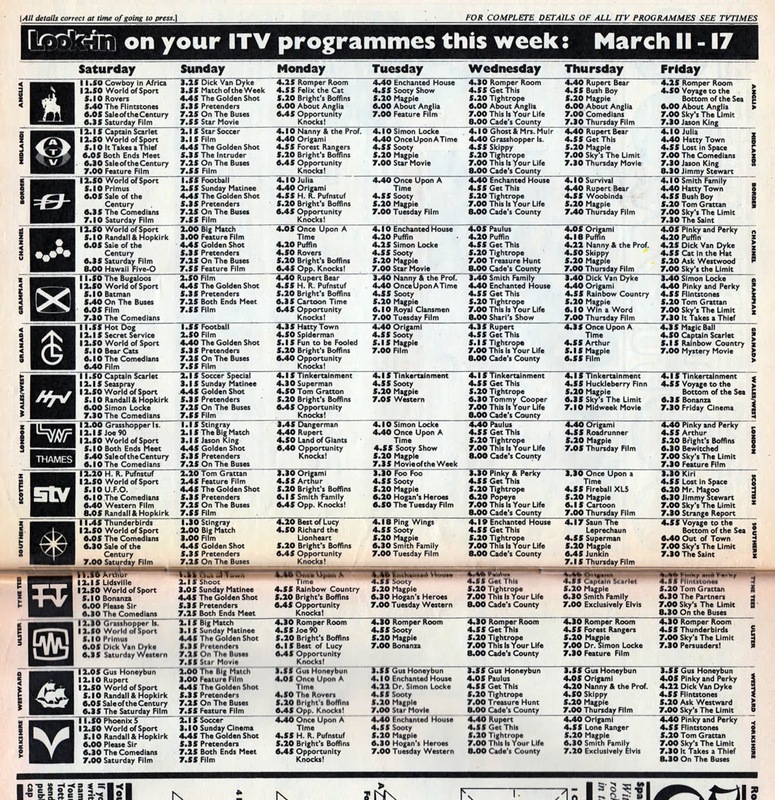 Part of Look-In's unique appeal was that as a publication associated with ITV it was allowed to publish regional ITV listings. Although being a children's publication it only focused on teatime to early evening. Robert Harbin's 15 minute programmes Origami had amazed a lot of kids back then so a regular feature in Look-In was essential. 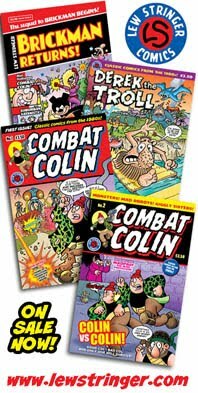 Priced at 5p, Look-In was more expensive than most of its rival comics, but it packed a lot of variety into its 28 glossy pages and proved to be a big hit with kids for many years. Ah, those strange days when the ITV regions actually showed different programmes from each other - now everyone except Ulster, STV and HTV Wales shows everything at the same time all day to stop people from complaining about not getting to see the same programmes as everyone else, and people complain that there is no local programming any more. I used to buy this every week right from the start " for my little brother " ( reading it myself too , of course ). He would have aquired a complete run of these until Marvel UK brought out POTA. Then I switched his comic over as I thought that I , I mean he , would prefer this. 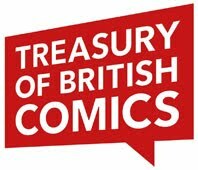 It's good that these days, there was a two volume 'Best of', which while sadly missing a lot of content, did a nice enough collection of the 70s and 80s (no 90s, probably cause it was too short) collection featuring comics, interviews etc. What's even better is a number of complete runs of strips have been released (Starfleet (translation of Japanese X-Bomber) was reprinted in a complete comic with the original DVD set.. Colour was added, which was good, it was also re-lettered, which was bad.. the new lettering seamed like a quick job and at lest one text balloon didn't get the text put back in it). Always felt that though the stories were much shorter, and sometimes not quite right, they mostly got the style of the show it was based on. 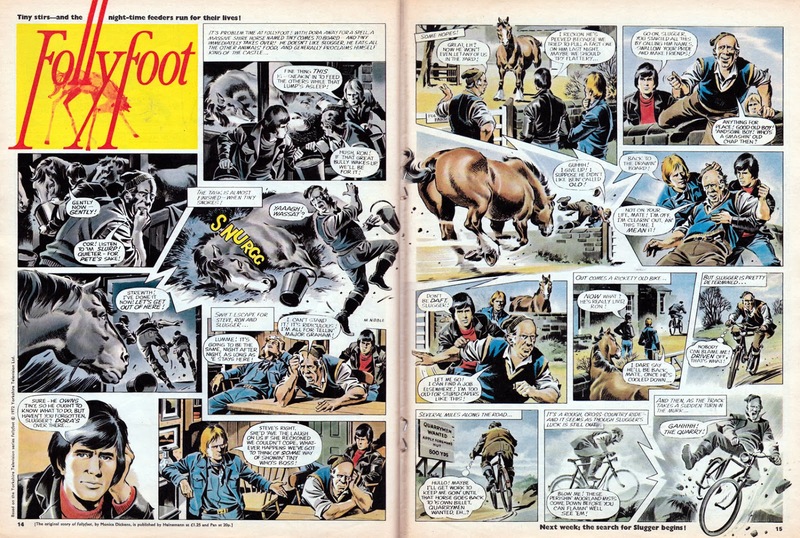 I never really considered Look-in a comic for some reason, so wasn't a big fan of it - of course being about 11/12 in 1971 my non comic purchases were based on music (Sounds, Disc etc) and Football ( Shoot, Match). Something I regret now after picking up a bundle of these at a Comic Mart about 10 years ago as it had some great art (I recall some stunning art on Kung Fu ) and it featured the work of one of my all time favourite UK artists Tom Kerr - its success makes you wonder why a publisher didn't try this again (probably too late now with cable TV and one off tv to comic adaptions) I certainly missed some great strips though. I often felt that the scripts let down some of the strips, but they did a good job adapting TV shows to suit the traditional British comic style. The art was always of a high standard though. I didn't follow Look-In regularly once it brought in pop features but the first 18 months or so I found very enjoyable. I know what you mean, Paul. When Look-In introduced the pop pull-outs in late 1972 I was 13, so I was more interested in The Mighty World of Marvel than a magazine with pin-ups of Donny Osmond! I think in later years Look-In became primarily a girls mag/comic, so I avoided it altogether then. However, it did feature a lot of great artwork, as you said, but it was never on my must-buy list. I personally preferred its rival COUNTDOWN/TV ACTION but sadly that only lasted for just under three years. 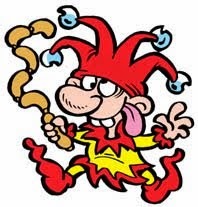 I bet Follyfoot helps to rescue him from the quarry and so come back to work for them...just guessing.. I no longer have the follow up issues Peter but you could well be right. Although Follyfoot was the name of the farm, not the horse by the way. I used to get Look-In on the odd occasions, mainly due to the Pop info inside. However, I do remember the stunning artwork by John Bolton on the Bionic Woman strip which deserves to be collected in some form! Thanks for the overview of Look-In. I've heard much about it over the years but never saw a copy on this side of the Atlantic. It's fun to see adaptations of classic TV shows and the art is of high quality. Can you answer a question that has puzzled me forever? 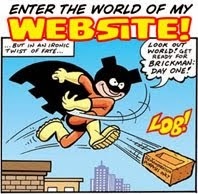 Exactly why was the magazine named "Look-In"? Is this an England-English idiom that means something specific, or is it just an odd (to me, at least) choice of a title? John Bolton is now quite the consummate artist with Marada the She Wolf to his credits. Anyone recall that Bionic Woman strip where a samurai was going to cut a man's hand off...For a children's mag like Look In that was pretty shocking. 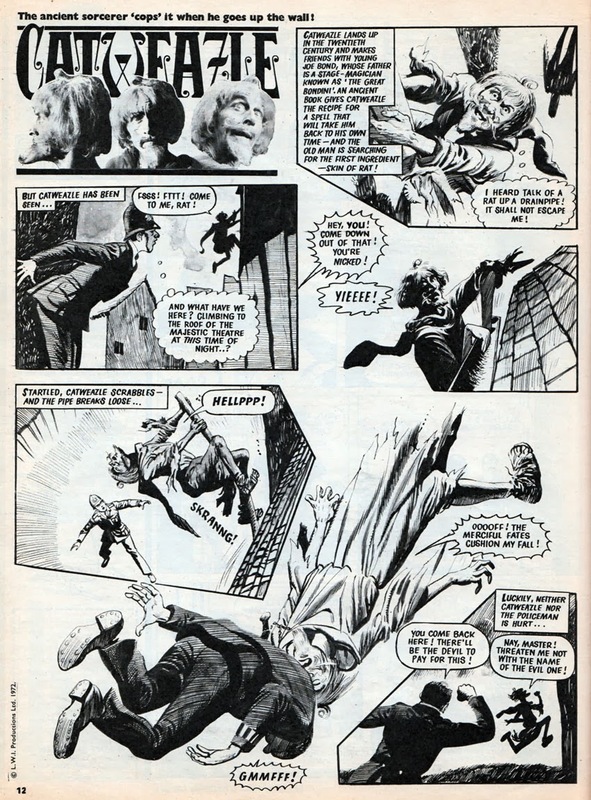 I also recall Arthur Ransome and his stunning realistic art on Space 1999 and the Tomorrow People strips. Really amazing. The title Look In just meant exactly what it said. ..look inside! 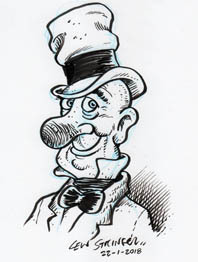 Smurfswacker, perhaps editor Alan Fennell just thought it'd make a catchy title, - and he was right. There is the expression "I couldn't get a look-in" if you're left out of something or unnoticed, so it might vaguely be related to that. 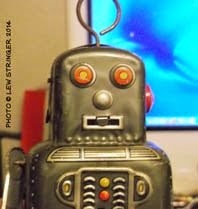 The TV ads for it carried the comment "Look out for Look-In" which was also catchy, I thought.